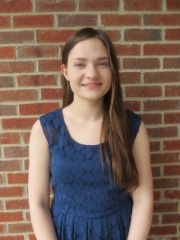 MCHS junior Sydney Woodard is among a select few high school students nationwide who have received a scholarship to attend a National Security Language Initiative for Youth (NSLI-Y) program this summer. Woodard will spend six-plus weeks this summer studying Mandarin Chinese in Kaohsiung, Taiwan. This will be her second summer spent in an intensive Chinese language-learning program; last summer she attended a residential Chinese language immersion program with the University of Mississippi’s Summer College StarTalk program. NSLI-Y was launched in 2006 by the U.S. Department of State to promote the learning of critical languages among American youth. The program immerses participants in the cultural life of the host country, giving them formal and informal language practice and sparking a lifetime interest in foreign languages and cultures. In addition to the Mandarin Chinese program in Taiwan, NSLI-Y offers programs in Arabic, Hindi, Indonesian, Korean, Persian, Russian, and Turkish-speaking countries. Woodard began independently studying Chinese once she entered high school, and began her formal language instruction last summer at Ole Miss. She plans to continue her Chinese studies through college and ultimately find work as an interpreter or translator.